My two favorite things: skillet dishes and rutabagas! 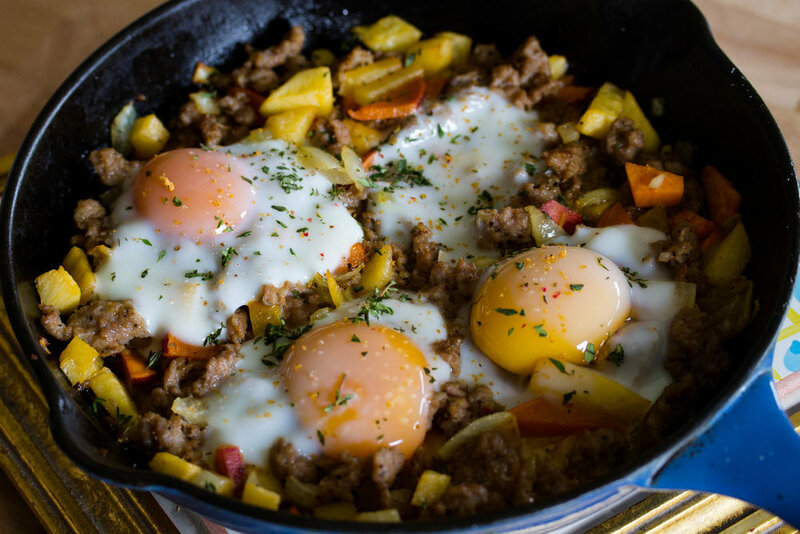 I love skillet dishes because they're incredibly easy to make and are great for meal prepping! Plus, they work for any meal and taste great thrown over a mixed greens salad. Rutabagas are the forgotten root veggie in my opinion, they're so delicious and I don't think they're used enough! They are a cross between a cabbage and a turnip and I like to incorporate them into many dishes, especially skillets! But I've also made them into fries which are incredibly delicious as well. Brown sausage in a skillet over medium heat, transfer to bowl and set aside. In same pan, melt lard and sauté veggies and apple with sea salt until translucent. Add back the sausage and mix until well combined. Crack eggs over top of skillet and back for 12-15 minutes or until eggs cooked to desired consistency.